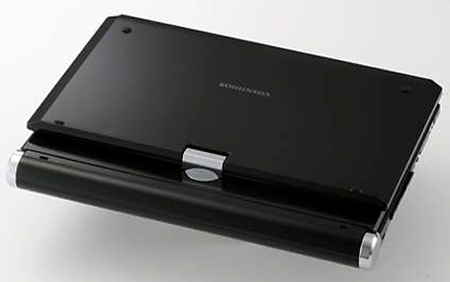 Japanese laptop maker Kohjinsha has rolled out a pair of Eee PC challengers, taking on the elfin sub-notebook with a pair of similarly sized tablet-style units incorporating 80GB hard drives. Fortunately, neither the SA5KXO8AL and SA5KXO8FL run Windows' Tablet PC Edition - they come pre-loaded with XP Home Edition instead. The operating system runs on the machines' 500MHz AMD Geode LX800 processor, which is backed with 512MB of 333MHz DDR 2 memory and said HDD. Like the Eee, the Kohjinsha SCCs (Small, Cheap Computers™) sport 7in, 800 x 480, LED-backlit displays, though here they're mounted on a swivel to allow them to be used tablet-fashion. The new sub-notebooks measure 218 x 163 x 25.4mm - all slightly less than the Eee's dimensions. But the Eee's lighter: 890g to 945g. 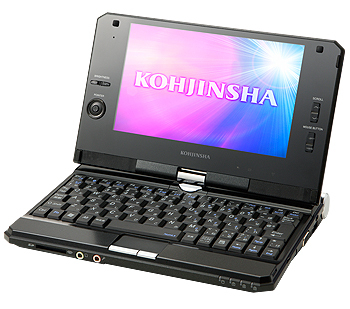 The Kohjinsha SCCs have 802.11b/g Wi-Fi and 10/100Mb/s Ethernet for connectivity. 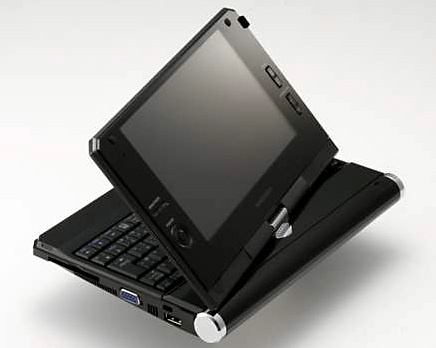 They have two USB ports, a three-in-one memory card reader, a CompactFlash slot, audio jacks and a VGA connector. Kohjinsha claims the units' battery is good for up to five hours' runtime. The SA5KXO8AL is priced at ¥59,800 ($591/£300/€374), the SA5KXO8FL at ¥79,800 - the premium buys you a copy of Office 2007 Personal Edition.